I have been enjoying my holiday 'staycation'! I've been able to spend tons of quality time with my bed, friends and family :-) I've been over my moms the past few days and last night literally watched half a season of The White Queen!! I love that I've been able to break out my more casual wear with being off from work. I thought this Hello Tee was fun, I had to pick it up. With all of the holiday sales, getting this marked down plus an addition 30% off doesn't hurt. Pick up fast, still in stores! 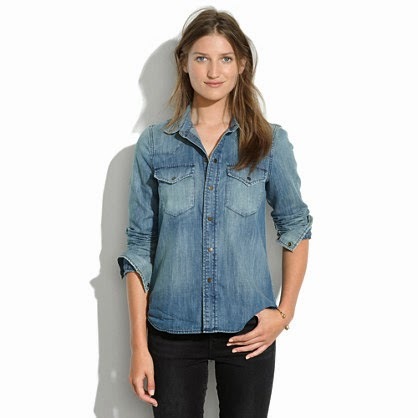 My go to shirt/light shirt jacket is the J.Crew Western Denim top. It goes well with anything and fits comfortably! Don't worry about matching denim top and bottoms, for me the more contrast the better! Ciao lovelies!